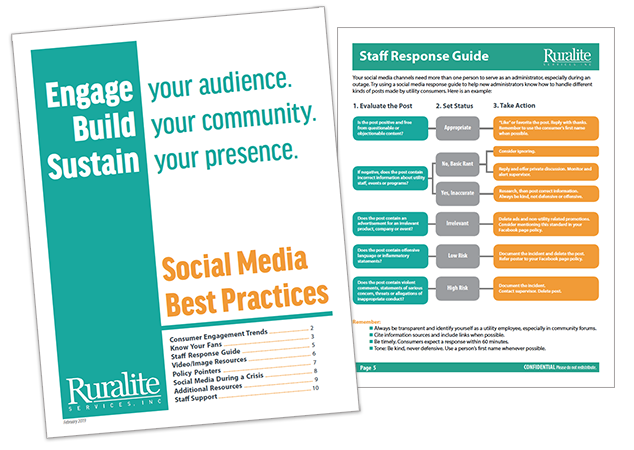 eBooks: How to Harness Messaging + Social Media Guide - Ruralite Services, Inc.
We’ve written two eBooks, How to Harness Messaging and Social Media Best Practices. Both publications dive into how utility communicators can navigate the swiftly changing digital landscape. Are you ready for a social media shift towards privacy? Learn how to use Facebook Messenger to offer ready replies, find time-saving tools and provide consumers with instant service. This eBook expands on an article I wrote for April’s NWPPA Bulletin magazine (NWPPA members only). While researching messaging, I tried ChatFuel, a Facebook Messenger chatbot (free up to 1,000 subscribers). Facebook’s Instant Replies are helpful, but they are limited to plain text responses. By using a chatbot, you create blocks rich with text, media and buttons. This is ChatFuel’s dashboard. Add blocks of information based on how a person responds. Have a question about rebates? The chatbot can take them to your website’s rebate page. Do they want to use less energy? Offer the right email address or phone number to call to schedule an efficiency audit. Do they want to report an outage? Provide your outage reporting number or a website where they can report the problem and watch progress. Want to see how this works? Send a message to our Facebook page. Another nice chatbot feature is the ability to send a direct message to someone who comments on one of your posts. For example, when a utility tells consumers about an outage, many people try to reply to report their power is out, too. Many chatbots offer an Autoreply option, particularly helpful during an outage. Create a chatbot autoreply rule to send direct messages to people who comment on either a specific post or any post with set keywords (power out, outage, no power). You want to use this sparingly. Automation comes with convenience but also a certain amount of risk. If you don’t like chatbots, there are plenty of other time-saving tools to help you quickly help consumers. No matter how you approach it, direct messaging will continue to grow in importance. Are you ready? Download How to Harness Messaging to learn more about how messaging can change how you serve consumers online. Discover consumer engagement trends, staff response guide, video resources, policy pointers and much more in our social media guide for utility communicators. This handy guide was updated in February to reflect current trends towards stories and privacy. Love this kind of support? Try our social media support program for FREE, just in time for Lineworker Appreciation Day! To download an eBook, go to our website. Enter your name and email address, then click, ‘Download eBook.’ That’ it! You’ll receive an email with a link to the publication(s). These eBooks are one of the many ways we deliver helpful solutions for utility communicators. Have topic suggestions? We are here to help. Send your ideas and requests to MarCom@Ruralite.org or share them as a comment on this blog post. Happy learning!